This is an interesting article which introduces the topic of plant science to this forum. Scholarly entries only please. Clover and other legumes form a unique symbiotic relationship with bacteria known as rhizobia, which they allow to infect their roots. This leads to root nodules being formed in which the bacteria convert nitrogen from the air into ammonia that the plant can use for growth. Exactly how these plants are able to distinguish and welcome in compatible rhizobia for this self-fertilising activity—while halting infection by incompatible bacteria—has been a mystery. To better understand the impact of phytohormones on root microbiomes, the team compared wild type root microbiomes with those of mutants lacking at least one of the following phytohormones: salicylic acid (SA), jasmonic acid or ethylene. Previous studies had shown that the compositions of root microbiomes can vary after infection, even if there were similar starting microbial communities. Is Fungus As Gross As You Think It Is? Not actually a plant, but many types interact with plants in lots of interesting ways. Lots of symbiotic relationships, for instance, and also really important for decomposition. On top of that different types of fungus may hold the key to solving the problem with colony collapse disorder in bees, which directly impacts plants, yet again, due to the role bees play in pollination. So, even though not a plant, fungus still is important enough to plants to be included in this thread. Can Bacteria Live Off Electricity? Another living thing that isn't a plant (or an animal), but this is definitely an interesting science discussion. Why Do Humans Have Less DNA Than This Flower? Giant genomes don't necessarily confer any advantages on an organism. Interesting information about the "behavior" or plants. Can One Mathematical Model Explain All Patterns In Nature? Not only was he one smart cookie, but he also showed us that great minds don't usually conform to the mold. 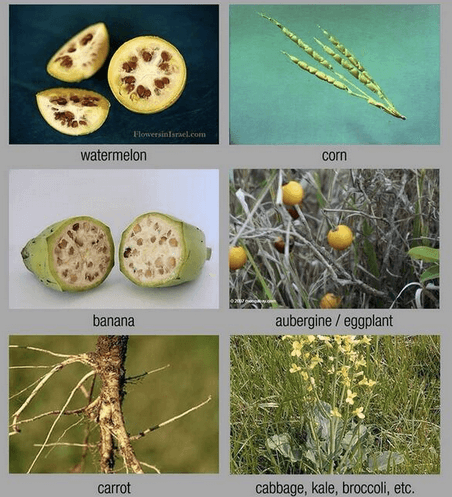 How your food would look if not genetically modified over millennia? Humans have been altering animals and plants for many, many centuries and the result has been domesticated animals and fruits and vegetables which are much more useful than their naturally occurring ancestors. Ever wonder how your food would be without any human intervention over the course of agriculture history? For thousands of years, farmers have manipulated their crops to get the best yields and have resulted in many of the produce you see today. To state factually that these were original plants that evolved into what we know now is a foolish assumption that we know the answer to the age old question of, "Which came first. The chicken or the egg?". For all anyone knows plants like these could be ones that simply degenerated from modern ones that we have now; rather than starting out that way originally, and evolving into them. Plants have been genetically modifying themselves since the beginning. There is no reasonable proof that they once looked like this. Cross breeding plants to produce better yields or resist pests is one thing; but artificially genetically modifying them to produce their own poisons to kill insects is just asking for trouble. On some level companies like Monsanto must know this. Aside from injecting pig or human genes into a plant; developing one that is resistant to a particular pesticide on which you hold the patent for both and encouraging farmers to simply spray more deadly pesticides is criminally insane. Diversity is what encourages life to genetically modify it's self; yet somehow this concept has been artificially adapted to monoculture the antithesis of diversity. To say it's playing with fire is a gross understatement. The results of such experimenting have been put into widespread practice with almost no testing or knowledge of long term effects. In some way even our laws have been genetically modified. It's one thing to allow people to choose to eat these foods but to make it illegal to label foods that haven't been genetically modified is equally criminally insane and should not be tolerated in a healthy society.